When the cutting out is harder than the sewing! Although that is not unusual for a Marcy Tilton pattern. 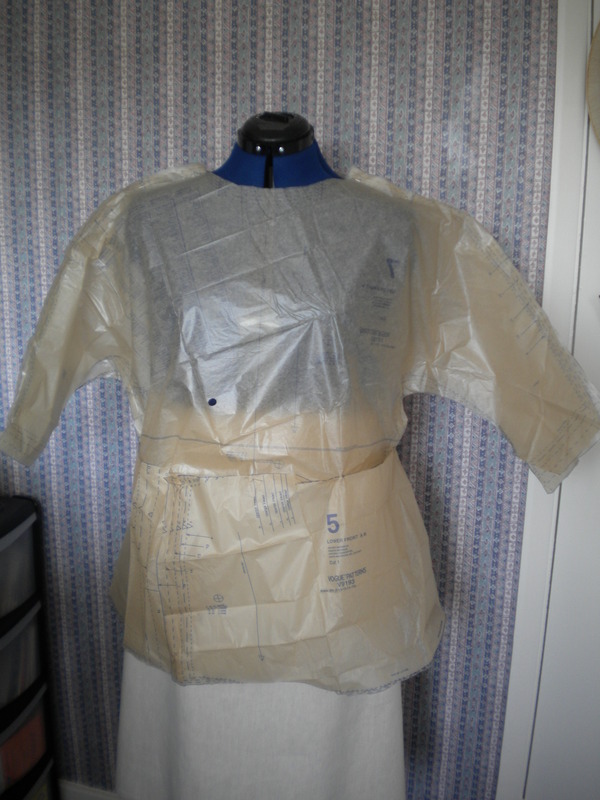 It’s cut from a single layer, so the first thing that I did was to mock up the pattern pieces on my dress form to get a guide about the width and length of the garment. Tilton garments are inclined to be on the large size, although this one is meant to be lose fitting. Lessons learnt from previous experiences! Not an attractive picture, but it proved several things: the width and length would be OK, and more particularly, having joined all but the neck casing to find out this information, I realised that, subject to accurate marking, this was going to be quite easy to make. And it looks pleasingly similar to the version on the pattern cover – which is Vogue 9193, by the way. The trousers are from the same pattern and I think that mine actually look better than the envelope cover. The tunic fabric is from Girl Charlee, a new supplier to me, but I have read a lot of good things about them, and thought they might be the best provider of unusual black and white jersey. It arrived in 2 days. The jersey is quite thin, but then again, it wasn’t expensive at £6.45 a metre (plus postage), and with a bit of judicious tacking to hold it all in place, it has made up nicely. I had to use both the over-locker and stretch stitch on the sewing machine to make this, which is a bit of a logistic issue on the dining room table, but having read the pattern in advance, and seen how it was made from the mock up, I was able to rationalise the over-locking and machining. It is possible to juggle the order it is made to do all of the over-locking in one visit to the machine. In fact, I overlocked the edge of the neck facing in place, which is not as per the instructions, but seems to have worked well. The pocket (unusually on the left hand side – is Marcy left handed I wonder??) is inclusive to the top and bottom section pieces, and has to be stitched at a right angle in the waist stitching; hence the need to use the sewing machine. Just after I had trimmed the waist fabric I did wonder if I should have finished it on the over-locker, but it was too late; I’d not left enough fabric, and it could have gone wrong…. It’ll be OK. The sewing probably took about 2 hours. The cutting out did actually take less time than that, but if you are keen on crawling around on the floor, that’s the place to do it. I’m not, so I was carefully pulling fabric around on the table for quite some time. One good thing; my choice of fabric allowed me to find the straight grain quite easily, which can be very difficult with jersey. I never attempted a pattern match, but actually, its not very far off. Its about 1.5 cm off a pattern match all round; sufficient to show that there is an upper and lower section, but close enough to look good. The trousers are from black linen bought at Barry’s fabrics. Construction is similar to the top, as they hang from a yoke with pockets formed from the yoke and leg pieces. Once the ‘square’ markings are lined up with the seams, the rest falls into place, and they are far easier to cut out than the tunic. The only challenge with the trousers is that because they are shaped at the bottom, you have to get the length right before cutting them out. So judicious, and slightly risky use of the tape measure was called for. I shortened them by all of 2cm. Maybe that’s why I think mine look better than the pattern envelope; because they have been cut a little bit longer. Anyway, despite some reservations about the design, I can happily say that I rather like these trousers and have worn them quite a bit. In fact I like them so much that I have made another, slightly silly pair in a harem style, about which I will write a short blog once I have photos. This entry was posted on May 13, 2016 by ann hebden in Fashion, Handmade, Marcy Tilton, Sewing, Tops, Trousers, Tunic, Vogue and tagged Fashion, Handmade, Marcy Tilton, Sewing, top, Trousers, Tunic, Vogue.